Superfoods provide the highest amount of nutrients with the fewest calories. Dogs and humans can share many natural foods that are nutritionally dense, and boast a variety of healthful benefits in each serving. They can help your dog fight disease, boost energy, and maintain overall health. 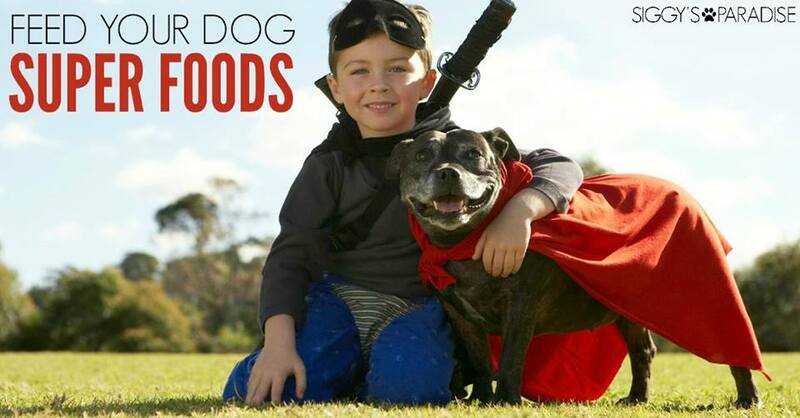 Superfoods make excellent additions to your dog’s diet, whether you homecook meals or feed packaged dog food. Consider adding these nutritionally packed ingredients to your dog’s diet. Blueberries. The rich, blue color is a result of potent antioxidants. The berries also supply vitamins C and E, fiber, and manganese. Carrots. Carrots are packed with fiber, carotenoids, vitamins C and K, and potassium. They also contain manganese, magnesium, phosphorus, and most of the B vitamins necessary for energy production. Chia. The nutritional benefits include protein, antioxidants, calcium, omega fatty acids, and fiber. You can simply sprinkle chia seeds on your dog's food. Fish. Oily fishes such as anchovies, mackerel, sardines, salmon, and herring are loaded with omega-3 fatty acids, which do wonders for your dog's brain, coat, and skin. They also limit inflammation that causes pain associated with arthritis and other chronic canine ailments. Kale. This supercharged leafy vegetable contains a generous amount of vitamins, such as A, C, and E. It is an excellent source of antioxidants and supports liver detoxification in your dog's body. It also possesses anti-inflammatory qualities. Nori. Nori is a dry, edible seaweed and a Japanese staple. It contains protein, soluble fiber, vitamins C, E, and all the B’s, and minerals such as copper and zinc. It may have beneficial effects on anti-tumor responses, immune function, and fat metabolism. Pumpkin. High in soluble fiber and low in calories, pumpkin helps support healthy digestion. It is exceptionally high in carotenoids, potassium, vitamin C, and is low in sodium. It also has some B vitamins and calcium. Quinoa. Quinoa, linked to spinch, is a seed, not a grain. As one of the few vegetable sources of complete proteins supplying all eight of the essential amino acids, quinoa reduces the risk of diabetes, is a potent antioxidant, and an excellent source of many phytochemicals, phosphorus, iron, magnesium, and fiber. Sweet Potatoes. Sweet potatoes possess one and a half times more antioxidants than blueberries and are rich in beta-carotene. They are also packed with vitamin C to keep your dog's immune system strong and extremely high in heart-healthy vitamin A.
Yogurt. Friendly bacteria contain a variety of nutrients, such as iodine, zinc, potassium, vitamin B12, phosphorus, calcium, and protein. FREE SAMPLE - CLICK PHOTO!